Description: NS 6685 is Southbound at North Advance in Charlotte,N.C. Description: Eastbound manifest rolls through Mexico Missouri. 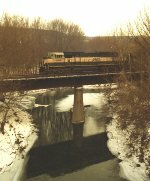 Description: A western visitor leads 12T across the Chenango River early on a cold Binghamton morning. Description: 12T with Grinstein BNSF unit and a pair of NS units crosses Goodrich Settlement Rd west of Owego en route to Buffalo. Description: NS 197 heads south at CP-229 on the New Castle District. Description: Behind the VFW, 0718 hours. Description: NS Northbound Vehicle Train 22R ( New Orleans, La. to Atlanta, Ga. ) pulling up to 20th Street in Irondale, Al. to swap crews before proceeding on toward Atlanta, Ga.